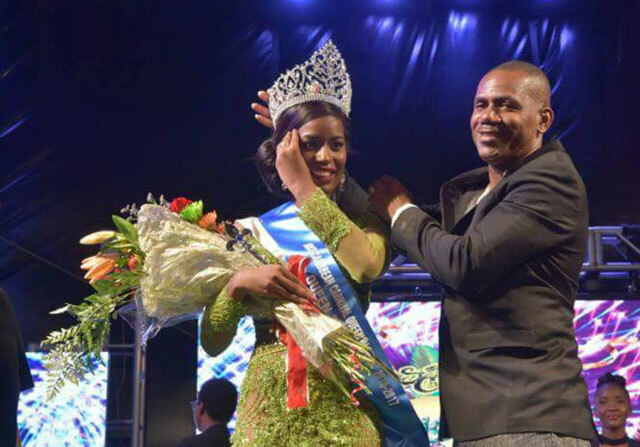 Basseterre, St. Kitts-Khyla Brown of St. Kitts is the first ever Miss Caribbean Carnival winner after she won the votes of the judges at the Sugar Mill on Saturday evening. In front of a fair sized crowd, Ms. Brown, who is a well-known vocalist, beat out six other contestants from across the region to capture the inaugural title. The contestants appeared in ambassadorial wear, swimsuit, performing talent, evening wear, and interview segment. Browne won best ambassadorial wear, swimsuit and evening wear on her way to 1556.80 points with her closest competitor Zhané Padmore of Barbados amassing 1458.10 points to capture First Runner Up. Ms. Padmore also copped the best performing talent award as well as the Miss Photogenic award. Second runner-up was Xarriah Browne of Nevis who won the best on stage Interview as she totalled 1400 points to edge out Miss Trinidad and Tobago Djennicia Francis who totalled 1389 points. Though 12 countries from across the Caribbean were scheduled to participate in the competition, only seven took part on the night of the show. The other contestants were Odessa Grogan Miss Guyana, Keshana Hammer Miss St. Maarten and Sasha Wintz, Miss British Virgin Islands. Brown’s triumph is her second crown for 2016 following her success in this year’s Caribbean Culture pageant held during the Culturama celebrations on Nevis earlier this year. She was also First Runner-up in last year’s National Carnival Queen Pageant. Female calypsonians will have their best shot to finally break the male dominance as four females have progressed to the finals of the Senior Calypso Monarch following a historic Semi-Finals at the Sugar Mill on Sunday evening. Eighteen participants vied for seven spots in the final where they would meet reigning two –time monarch King Astro slated for Dec. 29. Despite the female dominance, former Monarch King Socrates led the pack coming out of the Semi-finals with 811 points performing his tunes ‘Genocide in Disguise’ and ‘The Bride’. His nearest competitor was Calypso Craig with 784 points. Veteran Singing Jackie was third with 741 points while debutant Lil Miss Attitude and Queenie G was fourth and Fifth respectively. Rounding out the female contingent was Lady Diva who finished in seventh place with 722 points. King Hollywood was also named a finalist with 730 points while I-Soursop had to settle for the alternate as he was only able to garner 719 points. The other semi-finalists who failed to progress were Lord Kut, Lucious, Queen Kibbie , Jungle Lion, Princess P, Daddy Natuture, Mighty J and King Irvin.